The purpose of Emmaus is to develop leaders for the church. Christian action in their homes, churches, and places of work. lived and shared with others. What is the "Walk to Emmaus"? Following the three-day experience, participants are joined in small groups to support each other in their ongoing walk with Christ. Through the formational process of accountable discipleship in small groups and participation in the Emmaus community, each participant's individual gifts and servant-leadership skills are developed for use in the local church and its mission. Participants are encouraged to find ways to live out their individual call to discipleship in their home, church, and community. You will enjoy three days of singing, learning, laughing, worshiping, reflecting, praying and participating in small groups. Discussions center around fifteen talks given by laity and clergy. These talks present the theme of God's grace, how that grace comes alive in the Christian community and how it is expressed in the world. You'll also discover how grace is real in your life, how you live a life of grace, and how you bring that grace to others. You will have the opportunity to participate in the daily celebration of Holy Communion and to understand more fully the body of Christ. You will experience God's grace through the prayers and acts of anonymous service offered by the Emmaus community. You will leave with an experience of Christian love in action that will equip you for new levels of grace-filled service and leadership. To nurture this process of discipleship, the Emmaus movement offers specific opportunities. First, groups of four to six people meet weekly to reflect on their spiritual journey and encourage one another in accountable discipleship. Second, there are monthly community gatherings where Emmaus participants meet for fellowship, worship and instruction. Third, community members are regularly informed of the support needs of upcoming Walk to Emmaus weekends, and other opportunities for servant leadership. For more information in your area, go to www.iowawalktoemmaus.org. between the ages of 15-18? asking questions about your faith? thinking about God in you everyday life? experience God's love and grace in a new way? meet other people who are sharing God's love in the world? If you answered "yes", then Chrysalis is for you! Chrysalis empowers leaders to be the hands and feet of Christ. understand Christian love in action. Someone wants to sponsor you. 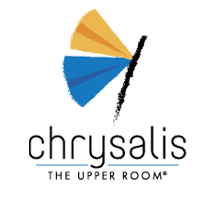 To attend a Chrysalis weekend, a participant must be sponsored. Your sponsor will travel the Chrysalis journey with you through prayer and love. For more information and registration, go to www.iowawalktoemmaus.org.